Chief experience officer at Allegacy FCU picked after presentation on "Mapping the Member" experience. 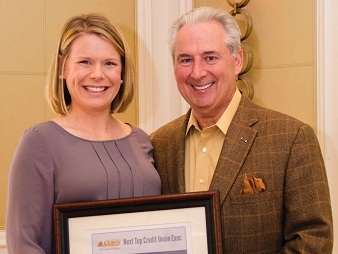 CUES President/CEO Fred Johnson and Ashley Kohlrus, the 2012 Next Top Credit Union Executive. Ashley Kohlrus, chief experience officer at the $965 million Allegacy Federal Credit Union in Winston-Salem, N.C., has been named the 2012 CUES Next Top Credit Union Executive.